Racing around Prince Edward Island was the topic of conversation among sailors on the deck of the Charlottetown Yacht club for many years, but the "oldtimers" always said "too dangerous" due to the lack of accessable ports on the north side of the island. In 1978, after safely cruising around the Island, Allan Holman and Paul Nicholson formed a Race Committee along with Fred Hyndman, John Rankin (former commodore) and Ron White (also former commodore) and the race was in the planning. By the first of June, 1979, a race notice had been released and the search for entries was taking place. Interest was high. The date was set for the first Monday in August (6th) 1979, and the starting gun was at 12:30. This would allow the most spectators a chance to see the start on their lunch break. 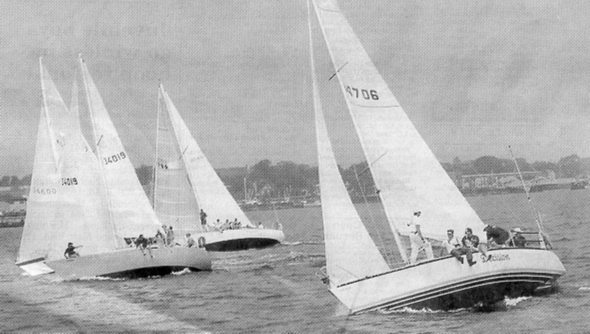 Although not as many as originally hoped, eight boats did start that race on August 6th, 1979. Before the first night was over a severe squall with reported "square" waves battered the fleet. All but Allan Holman's Contessa 26 sought refuge in Summerside Harbour. Come dawn, none of the exhausted crews were willing to resume the race. For the next 2 days everyone asked "Where's Holman now? ", as he worked his way around the Island. After almost 79 hours, including a manditory 6 hour layover in Souris Harbour, Holman and his 3 man crew crossed the finish line. Thus they became the first (and last) boat to finish the first race. Surprised at being the only finisher, Holman and crew challenged the other skippers to "explain" why they had "chickened out" at the post race dinner, and offered to pay next year's entry fee for the boat with the best excuse. Thus the tradition of Liar's Night was born, and what lies they told! Since that first race, five more runnings of this great event took place over the following five consecutive years. In 1985, although a race was planned, it never took place and it wasn't until the fall of 1996 that a new committee was struck and planning was again underway to revive this prestigious event. The race took place again in 1997 and it was planned at that time to have it every three years.